The comfortable wide open interior of this one story homes gives you more from every square foot. 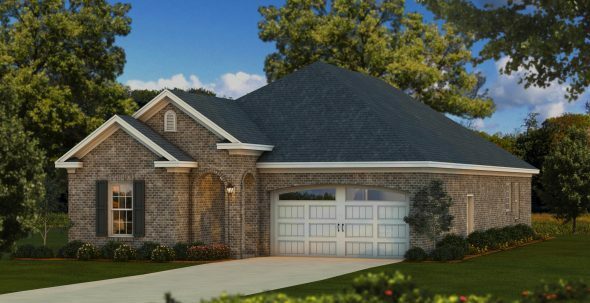 You’ll enter the home from the arched openings of the covered porch into the formal foyer. Off the foyer you’ll find the private entrance for 2 additional bedrooms with shared bath. The kitchen features luxury stainless steel appliances including gas cooktop, huge granite-topped island that seats four, and walk-in pantry for maximum storage space. The dining area features a double window for natural lighting. The family room is anchored by the gas fireplace and the large picturesque window overlooking the outdoor living area. The master bedroom features a private entrance and a door separating the bedroom from the bathroom for even more privacy. The master bath features a huge walk-in closet with access to the laundry room, water closet, soaking tub, separate vanities, and tile shower.